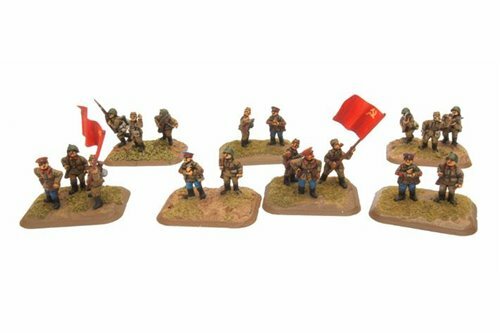 Soviet Flames of War figures. Soviet Russia There are 8 products. BM-13 Katyusha & crew. Truck, rockets and crew. Rifle and Early Motor Rifle Platoon - Conscript infantry forms the backbone of Mother Russia's armed might. 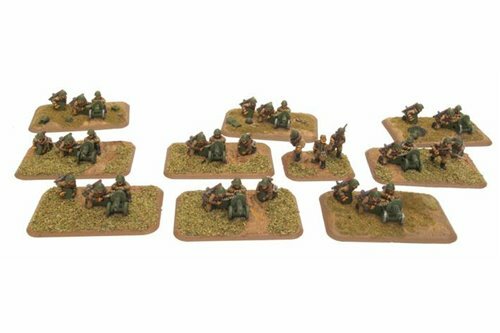 lightly armed, self sufficient and determined to win freedom from the German Invaders - Pack contains 9 Medium Bases, 1 Officer, 4 NCO, 4 LMG Gunner, SMG gunners and 31 Riflemen. Maksim M1910 Heavy Machine Gun Platoon - Equipped with the Maksim heavy machine gun, the platoon can lay down a withering hail of fire to support their comrades charging into combat - Pack contains 1 small and 9 medium bases, 9 HMGs, 27 HMG crew, 1 Officer, 1 NCO, 1 Rifleman. Combat Engineer Platoon - These extremely brave troops are trained in the task of assaulting tanks and heavily fortified positions with flamethrowers and explosive charges - Pack contains 5 Medium Bases, 1 Officer, 1 NCOs, 3 Sappers with molatovs, 9 Sappers with Satchel Charges, 8 Sapper riflemen.